Bluster Kong in the Donkey Kong Country episode Bad Hair Day. Bluster Kong is one of the characters exclusive to the Donkey Kong Country animated series except for a small appearance in Super Mario-Kun. Here, he appears in a chapter at the end of volume 23. Bluster runs Kongo Bongo Island's resident barrel factory, named Bluster Barrelworks, although it is actually owned by his mother (an unseen character). Occasionally, he speaks with his mother on a Mobile phone. He is constantly hitting on Candy Kong, his lone employee, despite the fact that she's dating Donkey Kong. Bluster is depicted as a stereotypical rich, spoiled coward. It is unknown if his affluence was inspired by Swanky Kong, who is implied to be wealthy. He is quite often an antagonist of the show, but typically not to the same degree as King K. Rool. Often, Bluster's attempts to impress Candy or help one of the other Kongs leads to more harm than good. Some episodes actually focused around this character insight, such as "From Zero to Hero", in which Bluster, thinking that he was going to die within a week after hearing Donkey Kong, Diddy Kong, and Cranky Kong seemingly talking about his x-ray pictures (they were actually talking about Cranky's x-ray machine). Another example of this is "Get a Life, Don't Save One", where Donkey Kong saves Bluster during an accident, and Bluster, indebted to DK, starts saving him from practically everything, even anything that's not really threatening. In one of his attempts to impress Candy Kong, Bluster wound up transforming into a heartthrob named Leo Luster as a result of mixing all his hair tonics together (he thought it was unnatural for his hair to fall out). After Bluster transforms himself into Leo Luster, he stops in front of King K. Rool and his baddies, who have just made off with the Crystal Coconut, and introduces himself. Donkey, Diddy, and Candy Kong witness him as he sings to introduce himself, causing Candy to fall in love with him. During the song, Leo hypnotizes the Kremlings using his abilities from his new looks to make them hand over the Crystal Coconut and leave. Then, he gives the Coconut back to Donkey Kong, who becomes jealous of Candy's attraction towards him. Diddy forces Donkey to leave, and afterwards, Leo invites Candy to come to Funky Kong's new snack shack with him. As he talks, he notices that his voice is changing back to his original Bluster Kong voice; he quickly heads back to Bluster Barrelworks to get more serum, just as he turns back into his old self. On their way, they are captured by the crocodiles and Leo Luster turns back into Bluster. The Kongs need Leo's hypnotizing powers to escape, but they have no serum. Donkey Kong encourages to find the Leo Luster within himself, as he believes that the serum only brought the Leo Luster part of him out. Bluster turns himself back into Leo with Donkey Kong's reasoning, and he hypnotizes the Kremlings so that they can free the primates and get back the Crystal Coconut. Afterward, Leo Luster turns back into Bluster once and for all. Bluster Kong has made one appearance outside the television series, in volume 23 of Super Mario-Kun. Bluster is portrayed as a rich stereotype; arrogant, rude, snooty, and selfish. Similar to King K. Rool, in season 1, Bluster's left eye will occasionally become enlarged. While usually self-centric and cowardly, he occasionally shows his soft side and genuine care for the other Kongs, such as when Diddy contracted Kongo Bongo Gone Wrongo Disease in "Speak No Evil, Dude". Even then, his attempts to be magnanimous tend to do more harm than good. Bluster is disliked by most of the Kongs, with even his own mother voting against him when he ran for the island leadership position in "Vote of Kong-Fidence". Despite their animosity towards him and his periodic mistreatment of them, the other Kongs are willing to work with him when necessary, make occasional attempts to get to know him better, and will help him when he is in genuine trouble. It has been hinted that Bluster and Cranky used to be on good terms, but while Bluster still considers Cranky a friend, the older Kong holds him in contempt, even going so far as to designating a particularly large vaccination needle for Bluster. Bluster has a lot of animosity for Donkey Kong in particular, considering him an idiot and saying he can't stand him. 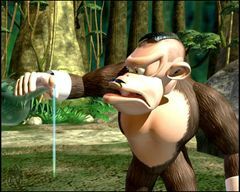 He often tries to prove that he's better than DK and rubs his wealth in the other Kong's face, even though DK really couldn't care less. Despite the fact that Candy Kong is dating DK, Bluster is always hitting on her, and having to compete with the other Kong may be part of why he dislikes him so much. However, there have been episodes where the two have worked together, such as "Hunka Hunka Burnin' Bluster", and "Get a Life, Don't Save One". Bluster also shows a side of him that cares about DK's well being when he saves his life. Bluster even shows he has a grudging respect for Donkey Kong in Kong For A Day. DK in turn also cares about Bluster a great deal to save him numerous times. Diddy and Bluster also have slight animosity, though not as high as DK and Bluster's. Despite Diddy teasing Bluster more than once, there have been times the two have been on friendly terms. Bluster considers Diddy a friend, and showed concern when Diddy caught the "Kongo Bongo Gone Wrongo" Disease. Funky and Bluster have a neutral relationship, even though Bluster gets annoyed with Funky's antics. Funky was willing to work with Bluster and get to know him in "Buried Treasure", but Bluster began panicking in response. Dixie and Bluster also have a neutral relationship. Dixie can't stand Bluster when he acts mean towards the other Kongs, though she usually gets along with him fine, even showing concern when he went after the Crystal Coconut by himself. Bluster and Candy's relationship have a mixture of animosity along with unwanted affection. Bluster has a major crush on Candy and constantly hits on her, to which she always would reject in favor of DK. In "It's a Wonderful Life" when DK wishes he was never born, Bluster and Candy actually get married, but under normal circumstances, she is disgusted with his flirtations and rude behavior. Despite his unrequited crush on her, Bluster has threatened to fire Candy on occasion, and often berates her for tardiness and refuses to give her raises at her job at his mother's barrel factory, where he acts as her boss. Bluster has tried numerous times to win her heart, but Candy always rejects his advances. They have moments where they get along well as friends. "I'm just one sneaky, peeping, two-bit step away from becoming an even richer richest ape on Kongo Bongo Island - and that's rich." "Marry me, Candy, and everything that's mine is yours, except for what's in this prenuptial agreement." "Wait a minute, not so fast! I want to go over that 'richer-poorer' part again with my lawyer!" "Can't we get this show on the road? I'm losing a fortune standing around here!" "There, how could Candy possibly resist me now? (looks at his comb) What's this? Hair? My hair?? AAH! My hair's falling out!!" "I can't use this. So what if I've lost a bit of hair? ...AAH! MORE HAIR!! I'm shedding!" "That unimaginative Donkey Kong would be more than happy to trade whatever treasure he finds for a... station wagon to cargo his bananas around." "Writing? Correct me if I'm wrong, but doesn't that involve knowing something like, say, the alphabet?" Bluster: At least it would have, if you weren't such a clumsy klutz! Bluster: (after voting for himself) May I have another? Bluster: (when he gets vaccinated by Cranky) Owwweee!!! Sometimes I think that you have an extra long needle just for me Cranky. Cranky: (puts away the long needle next to the short needle) Don't be silly Bluster. DK: Your mustache is stupid sir. DK: What, don't you remember? I'm gonna be the ruler of Kongo Bongo Island someday! The Crystal Coconut said so! This page was last edited on April 13, 2019, at 12:06.